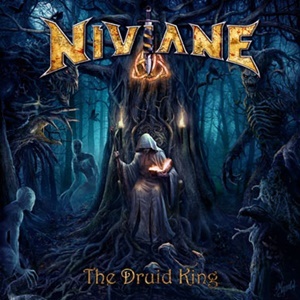 Fueling a new breed of American power metal, Niviane (pronounced nih-vy-anne) hail from Sacramento, California and started in the fall of 2014. The quintet has taken a couple of years to assemble the right players, vocalist Norman Skinner probably possessing the most street cred in the scene because of his work in Imagika during the mid to late 2000’s. The Druid King is their debut album, combining traditional/power metal with class, grace, and a sense of worldwide sophistication that places the songwriting and performances at a level rarely achieved this early in a band’s career. Much of the guitar foundation that Gary Tarplee and Mark Miner employ has that darker edge while still executing thick riffs and clean nuances that are very enticing and exhilarating – conjuring aural visions of Queensrÿche, Savatage, and aspects of Crimson Glory during their prime for “Watch the Banners Fall” or “March of the Jötunn”. Patches of keyboard/orchestral pop in now and again, but they aren’t a primary driver for the Niviane foundation – used as enhancement much like the sword fighting sequence that opens “The Berserker”. Occasional spots of heavier, staccato-oriented gallops or cultural / melodic runs galvanize the hooks, allowing the steady drumming of Noe Luna to propel the rhythm section in metal 101 ethics for highlight efforts like “Into Twilight” and the title track much like Primal Fear or others in that European power mold. The Middle Eastern/exotic inflections play against each other in a push and pull manner to start “Adrestia”, the main guitar hook and lead play taking older 80’s power aesthetics and propelling them into a modern, biting atmosphere. Norman’s professionalism and versatility when it comes to the vocals takes the band from impressive to outstanding. His clear command, keen sense of knowledge for holding out the right notes, and ability to move from lower register to siren Halford/Dickinson-oriented screams keeps the listener engaged consistently – the versatility shining on the shapeshifting “Watch the Banners Fall” just as much as the stomping marcher “Arise Samurai”. The cover art reflects what you should expect musically from Niviane- the blue color scheme and forest scene working in tandem with the meaty power context. The Druid King is an excellent debut from a US power metal band that concentrates on solid musicianship and strong songwriting/execution first and foremost, hopefully an indicator of a bright and fruitfully creative career in the offing.